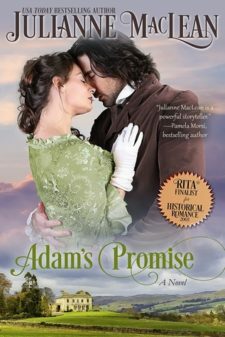 Adam’s Promise was a Romance Writers of America RITA Finalist – nominated for best short historical romance of 2003. It is a sweet and clean historical romance. Adam Coates was a mere tenant farmer when he left England for the British Colony of Nova Scotia, but now he is a prosperous and influential landowner. What Madeline doesn’t know is that her father has hoodwinked them both—for the bride Adam truly wanted was her beautiful, older sister, Diana—his first love. When Madeline steps off the ship with romantic dreams of her long-awaited happily-ever-after, she is shocked and dismayed to discover the truth. Madeline is furious with her father for his treachery, but she has sailed across an ocean to an unfamiliar land and must remain, at least temporarily, under the protection of the man she still loves—the man who still intends to wed her sister. Over the coming weeks, as their friendship deepens and grows, will Adam come to realize that he’d set his heart on the wrong sister all along? Or will it be too late to find the happiness they both desire? "MacLean's quietly compelling writing turns this simple, classic love story into a richly emotional romance, and by combining engaging characters with a unique, vividly detailed setting, she has created an exceptional tale for readers who hunger for something a bit different in their historical romances."